Do not you eat carrot? Do you do it from time to time? Today you will discover the great properties that this vegetable has for your health, which will make it begin to have more presence in your meals. We have always associated that the carrot was very good for the eyes . However, this is quite short when we discover the great properties of the carrot that have a very positive effect on our health. Knowing them will encourage us to increase the intake of this vegetable. The ways of consuming carrots can be very varied . We can add it to salads, cut it into pieces to take hummus , we can eat them raw or cooked. In short, there are different ways to include them in our food. But, today we are going to see the great properties of the carrot and how they improve our health. Perhaps, if what we want is to lose weight this first of the great properties of the carrot we are not very enthusiastic. However, it may be a good idea to put it as an appetizer to open your appetite before lunch or dinner. Also, we can make a carrot juice to consume half an hour before eating. It is ideal for those people who are on a diet to increase muscle mass or weight, and for those who have problems eating, for example, children. Do not know what to eat at the time of snack or as a snack? Raw carrots can be an excellent way to avoid eating pastries during those times of the day when hunger "stings" us. But, besides, we will not only be feeding ourselves healthy, but strengthening our teeth and gums. Surely we were unaware that carrots contain fluoride . This allows our enamel to be in a better state and for our teeth to be protected from cavities. 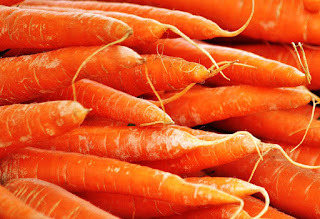 Another one of the great properties of the carrot is that it is rich in beta-carotene . This is transformed into vitamin A when the body assimilates it revitalizing the hair and making it look much brighter. In addition, if we have dry hair or a problem with the scalp, we should know that beta-carotene helps to produce sebum and regulate it , which is very beneficial to be able to show a healthy hair. It is good to consume fruits and vegetables and introduce them as much as possible in our diet. The reason that among all of them should have a special presence the carrot is because it helps us protect our brain, especially our memory . If we are in times of exams, if we often forget many things or if we are advancing in age and cognitive decline begins to make an appearance, we must consume more carrot. Whether raw, in salads or in the form of juice , this will boost our memory . Do you always feel very tired when you leave the gym and all you want is sleep? Maybe, you should check your diet. One of the great properties of the carrot is that it provides instant energy . So it can be a much healthier option than an artificial protein shake or a cup of coffee. We can take the chopped carrots in a taper if we are not going to go through the house or consume them as soon as we arrive at our home . This will help us to feel less tired in order to continue being productive. The positive thing is that this vegetable does not pose any difficulty or nuisance when transported. Therefore, we have no excuses for not consuming it. The last of the great properties of the carrot that we are going to mention has to do with the skin. Just as we spoke at the beginning that it is usually identified with better eye health, it is also related to obtaining a better tan . Here again acts the vitamin A that the body can process thanks to beta-carotene. When this vitamin is in our body two things happen: our skin is repaired and heals wounds in a faster way, and we are more protected from ultraviolet rays. In addition, consuming carrots will help us get a much more beautiful tan . Of course, this should never replace a sunscreen. It is necessary to include this vegetable in our diet, but we must continue putting an adequate protection factor to our skin type. Did you know all these great properties of the carrot? Do you usually include it in your daily meals? How do you consume it? We encourage you to try to take it more often so you can take advantage of all the benefits it can provide.